The heart requires its own constant supply of oxygen and nutrients, like any muscle in the body. Two large, branching coronary arteries deliver oxygenated blood to the heart muscle. If one of these arteries or branches becomes blocked suddenly, a portion of the heart is starved of oxygen, a condition called "cardiac ischemia." If cardiac ischemia lasts too long, the starved heart tissue dies. This is aheart attack, otherwise known as a myocardial infarction -- literally, "death of heart muscle." 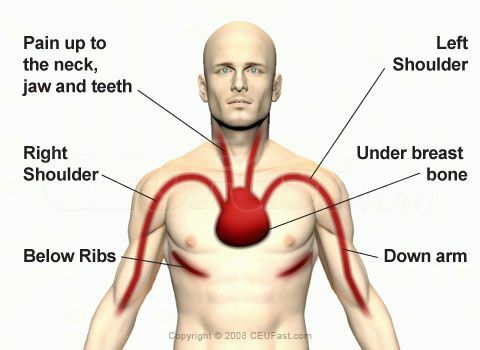 Other signs of a heart attack include shortness of breath, dizziness, faintness, or nausea. The pain of a severe heart attack has been likened to a giant fist enclosing and squeezing the heart. If the attack is mild, it may be mistaken for heartburn. The pain may be constant or intermittent. Also, women are less likely to experience the classic symptoms of chest pain than men are. Call 911 immediately if you believe you or someone you know may have had a heart attack. Getting prompt medical treatment will greatly improve the chances of recovery. 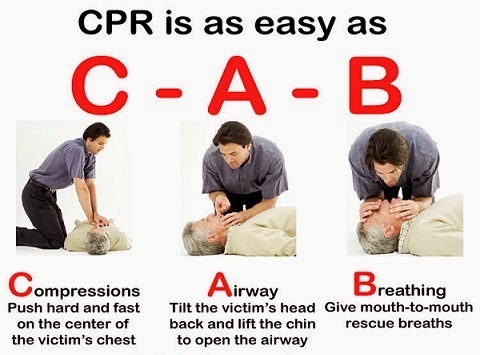 Call 911 right away if you think that you or someone you know may be having a heart attack. Diabetes is a condition that causes blood sugar, or glucose, levels to rise. High blood sugar levels can damage blood vessels and eventually lead tocoronary artery disease. This is a serious health condition that can trigger heart attacks in some people. How Is Acute Myocardial Infarction Diagnosed? To determine whether you’ve had a heart attack, your doctor will listen to your heart to check for irregularities in your heartbeat. They may measure your blood pressure as well. Your doctor will also run a number of different tests if they suspect that you’ve had a heart attack. An electrocardiogram (EKG) may be done to measure your heart’s electrical activity. Blood tests can also be used to check for proteins that are associated with heart damage, such as troponin. Your chances of recovering from a heart attack depend on how much damage there is to your heart and how quickly you receive emergency care. The sooner you receive treatment, the more likely you are to survive. However, if there’s substantial damage to your heart muscle, your heart may be unable to pump an adequate amount of blood throughout your body. This can lead to heart failure. Heart damage also increases your risk of developing abnormal heart rhythms, or arrhythmias. Your risk of having another heart attack will be higher as well. Many people who’ve had heart attacks experience anxiety and depression. It’s important to speak with your doctor about your concerns during recovery. It may also be beneficial to join a support group or to speak with a counselor about what you’re going through. How Can Acute Myocardial Infarction Be Prevented? There are many steps you can take to prevent a heart attack, even if you’ve had one before. This is especially important for people with diabetes, high blood pressure, and high cholesterol. Exercising several times a week will also improve your cardiovascular health. If you’ve had a heart attack recently, you should speak with your doctor before starting a new exercise plan. It’s also important to stop smoking if you smoke. Quitting smoking will significantly lower your risk of a heart attack and improve both your heart and lung health. You should also avoid being around secondhand smoke.